As you all know by now, I love caramel to an almost unhealthy amount. Right now I have a caramel scented candle going too. I'm almost done being sick (it's been about 2 weeks in total). Turns out it was strep throat, and it did start out from my trip overseas to visit the FIL. I had to take 2 days off of work because it got to where I literally couldn't talk above a whisper, and am now on very helpful antibiotics. Sadly, tea only cures so much. Chugging ginger-honey tea (AKA fresh ginger and honey in boiling water), and oregano oil, helped make my throat feel a little better though. This tea is called Caramel on the website and it's from Tea Desire. I got it from Zach, my lovely significant other, for Christmas! 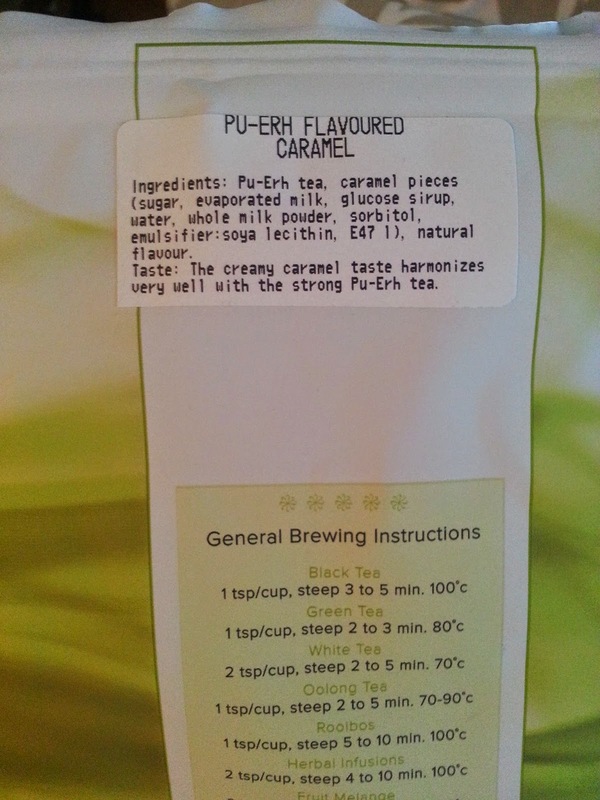 Rest assured, it is a pu'erh, and it does have caramel bits in it. And it smells divine. With the first sip I didn't really taste any caramel. The more I drank the more I tasted it. It never really became a super powerful BAM of caramel on the first flush. You may just love this tea! Starting next week, I may just do some love themed teas!